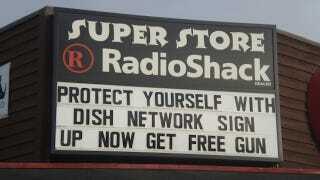 In a deal that the southern part of our country would find irresistible, a Radio Shack in Hamilton, Montana is offering a free gun to every customer who signs up with Dish Network. Now I've been offered many things when signing my life away for cable—LCD TV's, phones, iPads—but really? A gun? !